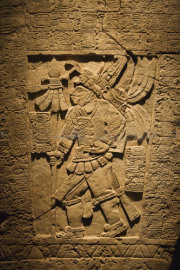 Section of a Mayan temple wall showing a royal man preparing for travel. Perhaps getting ready for the end of the world as predicted by the mayan calendar that ended in the year 2012. 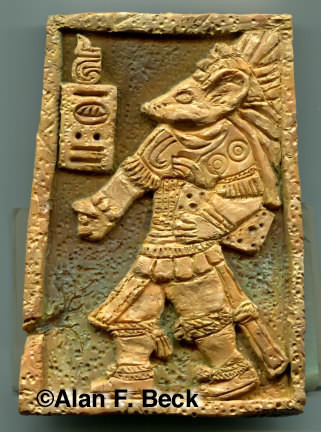 The glyphs on the Mayan mouse show the year 2012 with the fire symbol on top. "Mayan Mouse - End of the World" - Original Sold. Polymer clay and acrylic, 5" x 3"